Here at Decker, we are Driven To Be The Best. To own that title, we must strive to take care of each and every one of our professional drivers. We are constantly working towards more home time options, consistent miles, competitive pay packages, top of the line equipment, effective safety features, relaxing sleepers, and increasing incentives for each of our professional drivers. Our team sees this and because of our efforts and theirs, we are showing our appreciation. For 2019, we will continue to pay HIGH DOLLAR AMOUNTS to our professional drivers who refer other drivers to Decker Truck Line. For the first 3 drivers hired on as referrals, our referring Decker driver will receive $1,500 paid out within the driver’s first 90 days for EACH DRIVER REFERRED. When 4 and 5 drivers are referred within a calendar year are hired, our referring Decker driver will receive $2,000 paid out within the driver’s first 90 days for BOTH THEIR 4TH AND 5TH REFERRED DRIVERS. When our Decker driver refers 6 or more quality drivers, he/she will receive a $2,500 payout for EACH DRIVER REFERRED, again, paid out within 90 days of hire. After 1 hired referral, our referring Decker driver will receive a FREE Decker t-shirt. FREE Sirius XM in your truck for one year after 2 hired referrals. Personalized Elite Referral Team business cards after 3 hired referrals. Elite Referral Team Member jacket after 5 hired referrals. We are holding quarterly drawings (April 1st, July 1st, September 30th and December 31st) for one winner to receive a TABLET/LAPTOP OR $750 CASH EQUIVALENT. 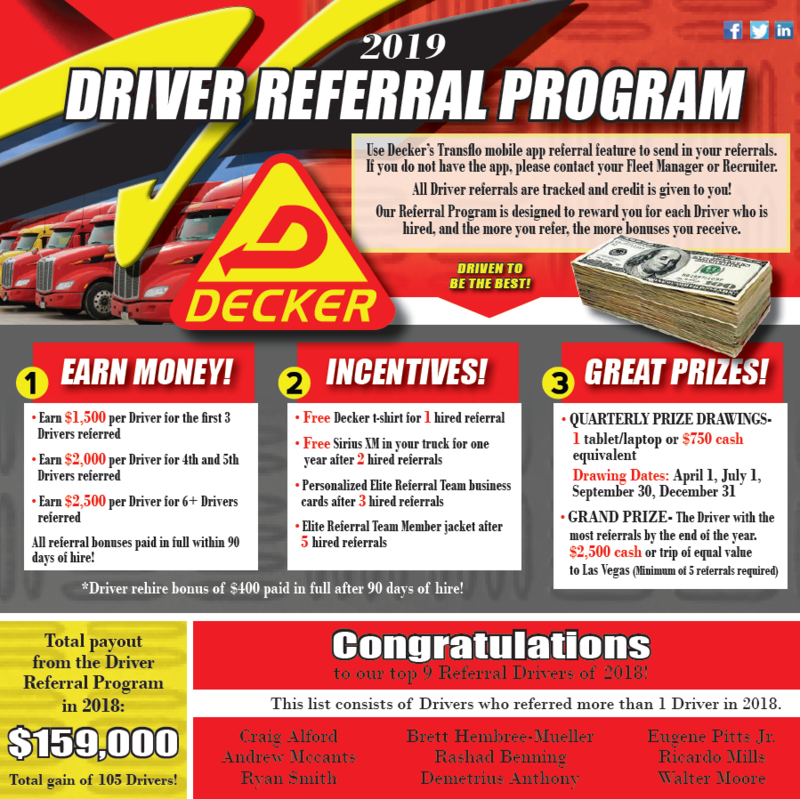 The Decker driver with the MOST referrals by the end of the 2019 year will win our GRAND PRIZE of $2,500 CASH or a trip of equal value to Las Vegas. The grand prize winner must have a minimum of 5 referrals. Last year, in 2018, we paid out $159,000 with our referral program. 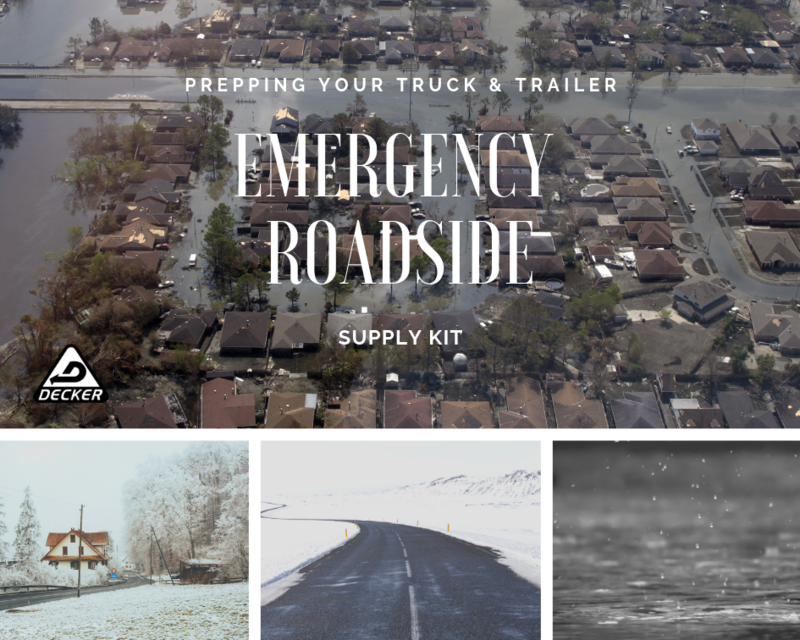 We have already received several referrals here in 2019 and expect to more than double the $159K of last year. 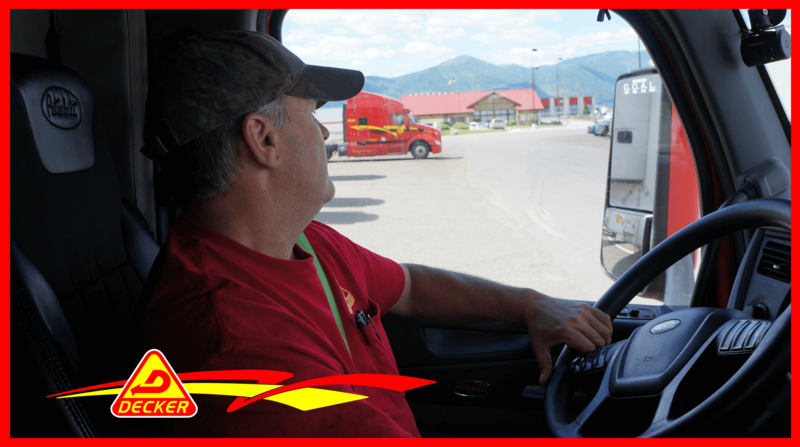 We are PROUD of our Decker drivers and encourage you to tell your story to others out on the road. Don’t forget, you can submit your referral through the Transflo app, email a recruiter or call 888.515.9427. Drivers can apply at www.DriveDecker.com and click, “Apply Now”. We are ALSO paying a bonus of $400 paid in FULL after 90 days of hire for those who refer a PAST Decker driver. Rehire referrals paid to the referring driver.